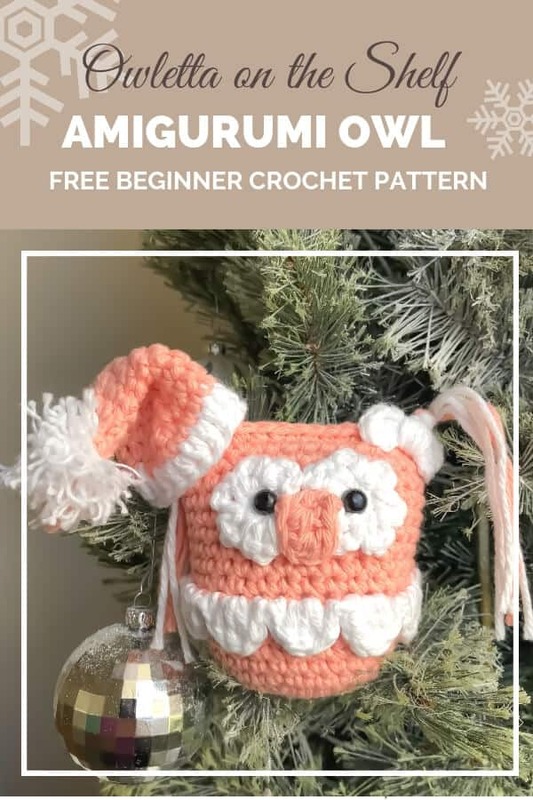 Day 10 of our 30 Days of Cozy bring us Owletta on the Shelf, an amigurumi Christmas owl crochet pattern from Jennifer of Jennae’s DIY Studio. This little own can be used with our wothout her little Santa hat. Make several in your Christmas colors and she’ll look great on your tree! Purchase the ad-free, downloadable PDF pattern on Ravelry or Etsy. Lily Sugar’n Cream Cotton yarn is a natural, 100% USA-grown cotton yarn. I used Tea Rose and White. Working into magic circle. Ch 1, 6 sc, turn work, *ch 3, sl st on top of sc*. Repeat * to * 5 more times. Ch1. Tip: Be mindful that the safety eyes go in the center. Leave a little space for them. Work into magic circle. Ch 3, dc, ch 3, sl st, ch 3, dc, ch 3, sl st, ch 1, cut approx 3″ of yarn, cut. Wrap around center of bow to give form. Pull yarn into the created center to secure the bow. Ch5, dc in 3rd ch, dc in next 2 chs, ch1. Owl’s body will be closed after attaching the eyes and filling the body. Turn owl’s body upside down. Working on the sc loops that are free. *[sl st, hdc], [dc, tr, dc], [hdc, sl st]* Repeat * to * 9 more times. Join end with beginning end. Cut 2 pieces of tea rose, and 4 pieces of white yarn into 10″ each. Use 1 piece and 2 pieces of each color for one side. Working on each corner of the owl’s body, with a crochet hook pull the yarn and create a knot with all the 6 pieces that are created. Take the cream yarn and separate all the strands of it. Put the yarn together to cut it at the same length. Ch 20. Sl st in 1st ch to form a ring. Ch 2 (counts as hdc), hdc in next 19 chs. (20 hdc) Sl st on top of first hdc, ch 1, cut. Hat’s Body With tea rose. Row 2: *Sc dec, sc in each of next 8 sc*. Repeat * to *. Row 3: *Sc dec, sc in each of next 7 sc*. Repeat * to *. Row 4: *Sc dec, sc in each of next 6 sc*. Repeat * to *. Row 5: *Sc dec, sc in each of next 5 sc*. Repeat * to *. Row 6: *Sc dec, sc in each of next 4 sc*. Repeat * to *. Row 7: *Sc dec, sc in each of next 3 sc*. Repeat * to *. Row 8: *Sc dec, sc in each of next 2 sc*. Repeat * to *. Row 9: *Sc dec, sc in each of next 1 sc*. Repeat * to *. Row 10: Ch 1, cut a long tail of approx 3″. Cut 2 pieces of white yarn, one of 5″ and other of 36″. Using the long piece, wrap around two fingers. Take out and squish the yarn. Use the small piece of yarn to tie the wrapped yarn on the center. Use the long tails to attach the pom-pom on top of the hat. Grab the eyes, be sure where your eyes would be, and secure it from the inside of the owl’s body. Fill the owl’s body using fiber fill. Fold the owl and close it by making single crochets on each stitch to join both rows together. Chain 1, cut where you have 5 inches of yarn, pull yarn out. This yarn strand will be part of the owl’s hair. Using tacky glue, attach all the parts to the owl’s body. I know you’re going to love making the Owletta on the Shelf and I so look forward to seeing your finished product. Jennifer is the creative mastermind behind Jennae’s DIY Studio. She began crocheting 27 years ago and published her first pattern in 2013. Her designs are unique and playful and she gets her inspiration from nature’s colors and kids play. When she’s not crocheting, you can find her sharing health and fitness tips and making memories with her family. You can find more of her work on her website at www.jdiystudio.com.